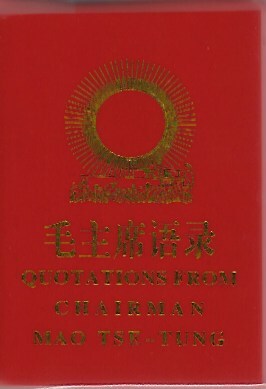 Quotations from Chairman Mao Tse-Tung is a collection of speeches and statements made by the chairman during his reign of the Chinese Communist Party. Some of these statements date to the early years of communism. Others come from speeches during the war against Japan and the civil war with the Nationalists. The state ordered publication of the little red book just in time for the Cultural Revolution, which rampaged through China from 1966-1976. My copy of the Chairman’s works comes from a flea market in Beijing. The market seemed to cater solely to foreign tourists. It offered a vast array of Mao memorabilia: photographs, buttons and posters galore. My little red book is exactly the right size for slipping into the pocket of a Mao suit. Handy for when you’re off to a political rally. When I was still taking Chinese lessons (attempt #2), our teacher would show us children’s programs from Chinese TV. The idea was to improve our understanding of spoken Chinese. Though, in my case, they mostly led to frustration. One of these films was called Yúgōngyíshān (愚公移山) or Moving Mountains. It recounted a Chinese legend about an old man who wants to shorten his journey from home to his farm by removing the two mountains that stand in his way. It’s an impossible task but the old man is undeterred. He says: it may take my lifetime and the lifetime of all my children and all their children’s children. One day, we will succeed. The next night, two spirits arrive to carry away the mountains on their wings. Chairman Mao used the same legend to illustrate a speech he gave in Yan’an in 1945. Today, two big mountains lie like a dead weight on the Chinese people. One is imperialism, the other is feudalism. The Chinese Communist Party has long made up its mind to dig them up. We must persevere and work unceasingly, and we, too, will touch God’s heart. Our God is none other than the masses of the Chinese people. If they stand up and dig together with us, why can’t these two mountains be cleared away? There are, of course, other sources where you can find a complete and typo-free version of all these quotations. Marxists.org, for example, has an on-line searchable version. But history won’t judge Chairman Mao on the literary quality of his words. Rather, we look to the consequences they had. His words, like all propaganda, were purely functional. To destroy and rebuild in his own image.